Are you or is someone you know struggling with depression, loss, or trauma related stress? Are you currently trying to help someone who is struggling with these issues? Have you or someone you know been stigmatized by a diagnosis that has become a label? Are you trying to make sense of suffering in your life and in the world? 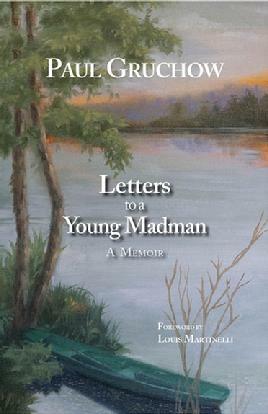 If so we would like to inform you of an important new memoir by the late Paul Gruchow, LETTERS TO A YOUNG MADMAN. Gruchow's eloquent book has been praised for its personal insight into the nature of depression and trauma and for its critical examination of the mental health treatment system. Foundation Website,  "Contact Us" page. but we are not yet ready to grant that they are fully human either. Manual – the bible of the mental health treatment profession. increasing depression: His genius level IQ, tested a few years before his death, was 187.
to defy illness, leaving behind a map for others to follow. the leading health crisis in the world, its impact becoming deeper and more widespread. from not only mental illness, but whatever affliction tries the soul. The wider audience that the book deserves would include anyone suffering major depression or other debilitating mental illness, as well as people who work in the field of mental health. The 2012 national year-end booklists, however, made no mention of the book, perhaps because Levins Publishing is a small, low profile regional press. The book was nominated for a Minnesota Book Award but has not received much attention outside Gruchow’s home state. Another factor besides coming from a small publisher is undoubtedly the perception that Letters must be a depressing book. Readers are, quite understandably, reluctant to pick up a book seen as being about depression, suicide, and loss of hope. That perception is incorrect. In spite of the dark moments and insights the book describes and in spite of Gruchow’s death by prescription drug overdose, Letters is ultimately a work of hope—hope that something good might come out of describing the crushing reality of major depression, that it might help others deal with the life-altering reality of mental illness. Gruchow describes the darkness that comes from depression, but he repeatedly finds some light in that darkness. Late in the book, after recounting years of living with thoughts of suicide and various treatments for his depression including Electroconvulsive Therapy, prescription medications, psychotherapy, and Dialectical Behavior Therapy, he takes a restoring walk through pine trees near Duluth. Suddenly we hear the voice of the younger Gruchow among his “friends”: “White and purple astors bloomed, jewelweeds sparkled, goldenrods turned every sunny nook brilliant yellow. The blue fruits of the bluebeard lilies vied with the scarlet hips of the wild roses for attention” (204). His depression briefly relents, and he tells us that “the feeling of vitality lingered for two days” (204). Even when it fades, he holds on to hope: “The darkness, as it does, closed in again, but I had the conviction this time that, if I could just get there, I knew where to go to find the light” (204). He never gives up on the belief that some path to recovery is possible. There is, of course, no happy ending. Gruchow himself makes a point of establishing from the start that this will be truthful book about a difficult and serious subject and therefore will not be “a good read” or “amusing” (1). He makes it clear that this won’t be like a visit to Lake Wobegon. Many passages in the book are emotionally wrenching—from his accounts of losing all sense of autonomy when he is hospitalized, to his contemplation of suicide, to his vivid account of lying on a gurney, awaiting Electroconvulsive Therapy. Other passages simply paint a picture of what it’s like to suffer major depression: “I once sat at my desk for three straight days, intent upon stamping an envelope” (19). There is also no one simple message. He faults others for dismissing and ignoring the mentally ill—for building psychiatric wards that do not consider their needs at all, for pushing treatments that may have devastating side effects— but he also finds fault with himself: “My biggest mistake was in allowing myself to be called disabled. When I did so, I became, in my own mind, disabled. And once that happened, I was disabled” (55). What good might come from describing the reality of serious mental illness? The book provides an answer: we could learn that the mentally ill are still people; that they may be capable of thinking about their own condition; and that any real cure has to involve an internal process, not just an external medical intervention. We could learn that clinical depression and other serious mental illnesses take us into deep water, places where most of us do not like to swim. But if you are in the ocean, you might welcome some advice and some companionship. Letters to a Young Madman, against all expectations, might be your lifeline, and just might change the world. art can contact her through our Foundation Website, "Contact Us" page. through this website if you would like to recommend a book for inclusion.